Discussion in 'Pokémon Animé Discussion' started by Zach8920, Sep 5, 2018. Unlike most characters the guy actually had a lot of appearances, especially the Pokemon Chronicles. 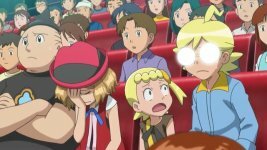 It seemed like the show really took to covering what Ash's rival was up to and then they just..stopped? Rather curious as to if there's any reason why they stopped, maybe an interview of some sort? Like a lot of stuff in the anime, it was forgotten and left to die because they couldn't do anything else with him. However the reason Ritchie appears in Chronicles is because he was a very popular character back in the day and people wanted to see more of him. He was really there because he was a parallel of Ash in many ways (similar personalities, both determined to be the best and having similar Pokemon like a Pikachu, Charmander, Butterfree and even a Swellow). He was also supposed to be seen as a better version of Ash, but since the OS Ash has improved as trainer and has far surpassed Ritchie, so if he was to reappear in SM or something Ash would Curb-Stomp him. He was really there because he was a parallel of Ash in many ways (similar personalities, both determined to be the best and having similar Pokemon like a Pikachu, Charmander, Butterfree and even a Swellow). He was also supposed to be seen as better than Ash, but since the OS Ash has improved has a trainer and has far surpassed Ritchie, so if he was to reappear in SM or something Ash would Curb-Stomp him. If OS and Chronicle Ritchie appeared now, yes. However, he would have also been improving vastly off-screen. Hiroshi was probably dropped from the series since he was essentially Satoshi's expy, which made him expendable. I didn't mind him myself, but it's difficult to miss someone who's a Satoshi clone. He was essentially Ash but with less flaws and the lack of an ongoing character development arc. Since there is debate to whether Ash himself has become this as the show went on, some think he is redundant. I admit he wasn't incredibly interesting compared to some of the other recurring characters, more an everyman. He's busy traveling the world over using his large pools of money. He seemed quite redundant even when he showed up in Jouto, which was one of my pet peeves about the Lugia mini-arc. I think Ritchie was originally supposed to be used a couple of times in the OS but he became very popular with fans which surprised the creators of the anime an$ they had no idea what to do with him after the Indigo League. I’m sure he was supposed to be like Snap/Todd and be tossed aside and forgotten once his usefulness in the series was finished. There are many characters with this treatment which includes Casey, AJ and his Sandshrew (you’d think he’d pop up again during the Indigo and/or Silver Leagues), and of course the Samurai. You forgot to mention gisselle, she even said that she would compete in the indigo plateau and wasn't shown and wasn't there even in the johto region like other kanto chars like duplica or aya. I’m sure he was supposed to be like Snap/Todd and be tossed aside and forgotten once his usefulness in the series was finished. There are many characters with this treatment which includes Casey, AJ and his Sandshrew (you’d think he’d pop up again during the Indigo and/or Silver Leagues), and of course the Samurai. I was actually expecting him to show up back at the Jouto League along with Nanako. I wonder if the reason why Hiroshi hasn't appeared in over a decade is due to his seiyuu's difficult schedule. He showed up post-Johto League though, in Chronicles. So it's only since then that we're wondering where he's been. Right, I had forgotten that he was in the Hoso episodes since to me they were quite unimportant. And I just remembered that his seiyuu voiced Luke in BW as well, so I guess Hiroshi's absence might simply be due to him being written off the anime for different reasons. I understand that you to they may not be important, but they were actually mentioned in the OP of this thread.....also I'm pretty sure that that even may be the reason for this thread.. if he were just like any other recurring character in Kanto and Johto that appeared once or twice and never again, that's one thing, but he was given heavy focus in the HoSos, so it's for that reason that it seemed weird to OP that he was dropped. The Celebi special was rather odd even by Pokémon standards. So much of the plot made little or no sense. How could no one ever notice the Celebi carving before even if it wasn’t visible if you don’t notice it? You mean to tell me after 75 years of probably continuous use that the furniture never once broke or wore down so much it needed repair and the carving would be able to be seen? And why exactly was Ritchie chosen and not some other random trainer to go back in time? Richie is like most elements from the older anime just a concept that was forgotten over the years. I highly doubt that he will ever appear in the anime again. He is not one of those really important characters with a cult following like Misty, Brock, Gary and Prof. Oak that are remembered by fans for many years. I still hope - we see him again. In some Special 25th anniversary episode in year 2022, ending of 8th generation. While I don't mind Richie and even like him to some extent... I'm not really interested on seeing him again.